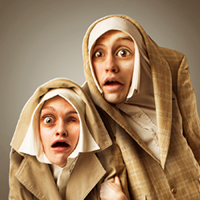 Knowles (James & Jamesy: 5 STARS - CBC, 5 STARS - Winnipeg Free Press) and Morin-Robert (Merkin Sisters/Blindside: 5 STARS - CBC) fuse their mastery of comedy and movement as they tear up their performance handbook, touch the untouchable and are blown away by the uproarious consequences. Winning Best Cast (London) and Best Choreography (Montreal), Bushel and Peck will boisterously charm your naked heart. I find it hard to write a proper review on this performance, as they had a catastrophic failure of a key prop, a light that was not only the centerpiece of many of the bits, but was meant to provide the primary illumination of those scenes. It shows the professionalism of real life couple Alastair Knowles and Stephanie Morin-Robert (of James & Jamesy and The Merkin Sisters) that they were prepared with a spare light bulb, but unfortunately the light itself was broken beyond any quick repair. They managed to persevere and by using an audience member’s cell phone as a replacement light, along with alternate stage lighting and a few verbal notes to the audience of what the scene should look like, were still able to put on a pretty good performance.